Noch gibt es lediglich Zeitrennen, in denen jeder Spieler von RaceRoom Racing Experience sein Können gegen die Uhr beweisen kann. Einen richtigen Einzelspielermodus gegen KI Fahrer oder gar einen Mehrspielermodus vermissen viele Spieler. Jetzt aber gibt es Infos zum nächsten Update und ein erstes Multiplayer FAQ inklusive anvisiertem Termin. Für die free-2-play Rennsimulation RaceRoom Racing Experience als auch das offizielle Deutsche Tourenwagen Masters Rennspiel DTM Experience konkretisiert Simbin die Veröffentlichung des seit langem von den Spielern herbeigesehnten Mehrspielermodus. Demnach soll es optimalerweise im Mai, spätestens jedoch im Juni soweit sein - R3E und DTM Experience bekommen einen Multiplayer Modus. Passend dazu wurden ein FAQ zu den Funktionen und weiteren Hinweisen sowie ein erster Screenshot des Multiplayer-Alpha-Browsers veröffentlicht. When will MP Alpha be available? Sometime in May or June. Hopefully May. 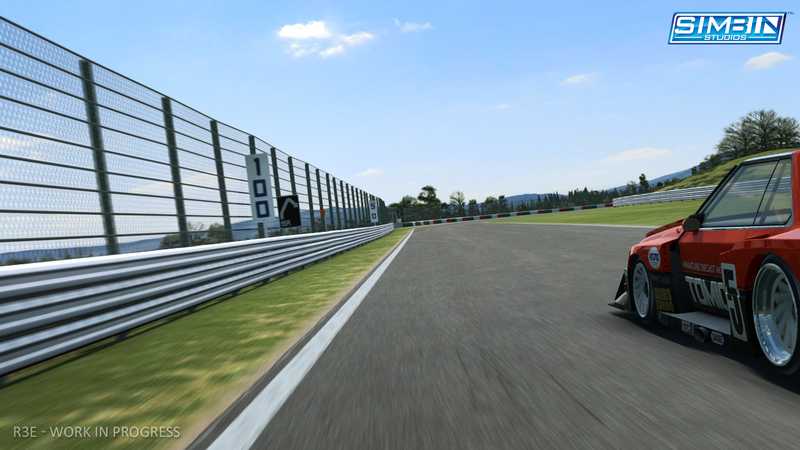 You said that it will be available to DTM Experience Season Pass Holders first. What does that mean? For stress testing the infrastructure with a limited amount of users, we are initially making the MP alpha available to DTM Experience Season Pass holders only. Basically, players who have purchased the preorder offer (DTM Experience 2013 + Season Pass for Season 2014) from the dtm experience and Race Department. What about players who only purchased DTM Experience 2013? The stress test with season pass holders is only for a few weeks. 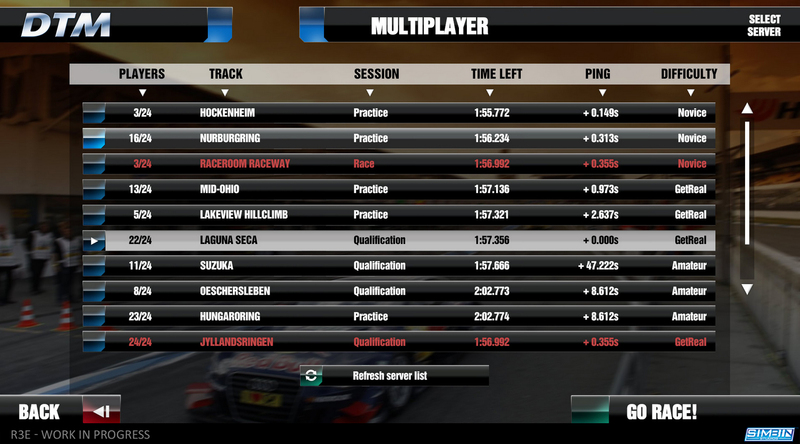 If all is well we will enable it to all DTM Experience 2013 players for further tests. What about R3E players who do not own the DTM Experience? We are working on a temporary menu system that will be similar to the Web based DTM Experience Menus. With that we will be able to have MP browser and all the other components to share both Single Player Race and Multiplayer Race with all R3E users. Please note the menu system we are developing is just a temporary one for the purpose of sharing MP and SP as soon as possible. It is not going to be the finalized, fully revamped UI/Menu system we are working on. I bought DTM Experience 2013 but not the season pass. Can I upgrade? Currently this is not possible and probably won’t be. Why make it available to DTM-E first and not R3E? R3E menus are using a middleware called Scaleform. As we are revamping the entire menu system and switching to a WEB based solution, any work done on Scaleform based menus would be tossed out later on, which is not the best way to use our time and resources. Most changes are also hardcoded and not very dynamic while the DTM-E menus are WEB based. They are dynamic and quick. It makes it easy for us to create the components needed for Multiplayer. The second key reason is the ease of limiting the number of players. It is a lot easier for us to limit the amount of players by checking whether they have Season Pass or whether they have DTM Experience. The MP Alpha is not an exclusive bonus or anything like that. We are simply limiting the numbers for initial stress testing. We will then make it available to a bigger chunk, and then finally everyone. This is mainly for Quality Assurance and Infrastructure testing purposes. The SimBin intro video is now skip-able. Hehe.. Fairly small change but I know a lot of people, including me, asked for this for a while now. We have also removed the exit screen. Because why not! We are adding VIP driver profiles to the portal. Drivers from real life race series will get a bit of a special profile. Players will be able to follow their profile similar to Twitter and race against their laptimes in competitions. Some drivers will join some competitions soon so stay tuned for more information on that. We are adding class based competitions. Players soon will be able to choose a car and livery within a class rather than being limited to one car and livery set by us. And we are adding competition history tab in competitions. Players can see their laptimes in competitions they have participated in the past.